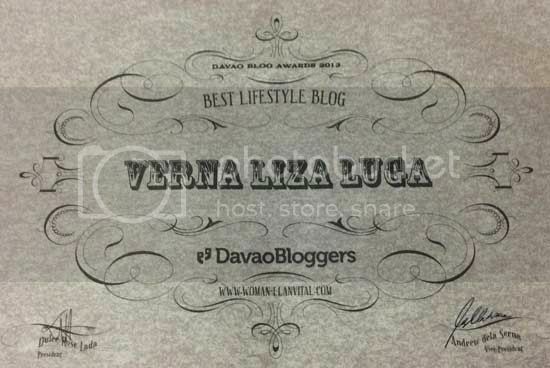 With so much honor and humility, I am thanking the beautiful people behind Davao Blog Awards 2013 for judging Woman-ElanVital.com as Best Lifestyle Blog for the year 2013. I had this blog in 2010, my second after my first blogger blog and I never have expected that my then pastime outlet of my Masters’ coursework in Gender Studies would lead me into something greater and wider. Also in November my article WHY THIS WOMAN IS PRO RH BILL has landed me a nomination as Blogger of the Year to the 2nd Globe Davao Media Excellence Awards. I wasn’t able to bag the award though, TheTravelTeller.com did, but being among the row of nominees as exemplary bloggers of Davao is more than an honor enough. I would also share this award with you my beautiful readers for constantly inspiring me to become the noblest blogger that I am. To the women of the world, let us inspire one another to become the first-rate versions of ourselves. Let our elan vital, our inner force flow and keep our channels open for greater and grander prospects that will come knocking our way. Thank you so much for believing in me, MERRY CHRISTMAS and have a GLORIOUS NEW YEAR!